Larson 170 All American original hull completely restored and refurbished BR (all) and with sterndrive Volvo Penta petrol 570A led to zero hour (06/2017) and 12 months warranty with feet totally sold out. 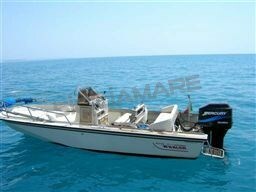 For real amateurs, a classic refittato with everything new: hull completely stripped, blasted and repainted, windshield disassembled and refurbished (all in solid), new glass, new led navigation lights, boarding caps, cleats, driving seat and host new completely new engine, bilge, sea ladder, new steering, GPS Garmin new Striker, push-new, led courtesy lights in cockpit , CD stereo with new Boss Marine speaker Horn, lights, bilge pump, autoclave, new refrigerator freezer with control lever again, 2 new batteries and containment boxes and caclaggi, new water tank, battery switches again. Roof cover in solid again, real deal. Larson 170 All American original hull completely restored and refurbished BR (all) and with sterndrive Volvo Penta petrol 570A led to zero hour (06/2017) and 12 months warranty with feet totally sold out. For real amateurs, a classic refittato with everything new: hull completely stripped, blasted and repainted, windshield disassembled and refurbished (all in solid), new glass, new led navigation lights, boarding caps, cleats, driving seat and host new completely new engine, bilge, sea ladder, new steering, GPS Garmin new Striker, push-new, led courtesy lights in cockpit , CD stereo with new Boss Marine speaker Horn, lights, bilge pump, autoclave, new refrigerator freezer with control lever again, 2 new batteries and containment boxes and caclaggi, new water tank, battery switches again. Real deal. 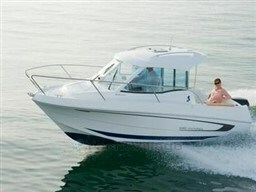 Dear Sirs, I have seen on YachtVillage your offer about Larson Boats 170 All American Br - 1989 (code: 410976). I am interested in the offer and would like you to contact me. Thank you. 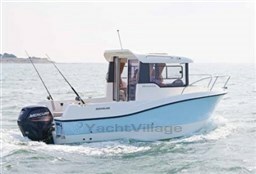 If you would like to find out more about this boat and any other boats of this type and range, Digibusiness Srl,the Company that manages YachtVillage, and Yacht Center Club, the Company that exhibits the Boat, must necessarily acquire some simple details about you (name, surname, email address and, if needed, your telephone number). These details will be processed according to the purposes and means of the processing indicated in the privacy statement under the PRIVACY Section of this website, referred to herein.